I am very excited today !! Our daughter and her husband and kids have been living with us, which has gone well. 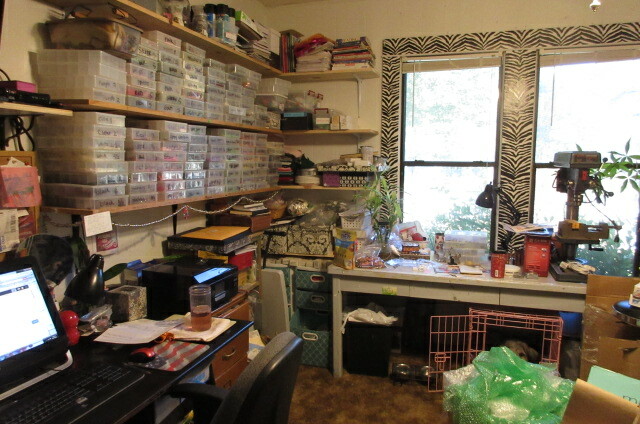 My only issue with them being here is losing my big studio and sharing a much smaller one with my husband. 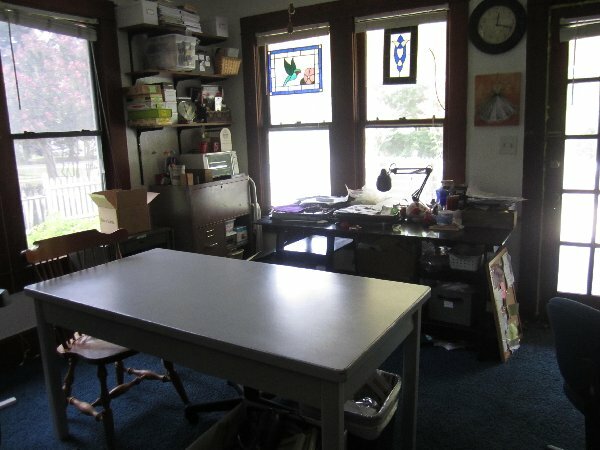 here is my current studio that I share with my husband , top picture is our puppy who hangs out with me in here !! 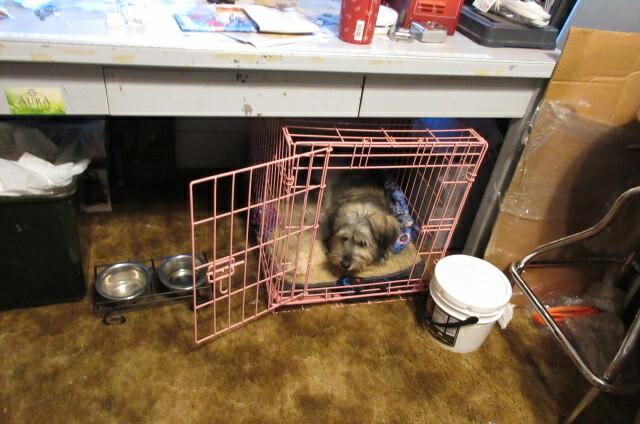 Her old crate, which is too small for everyday is fine for hanging out in here with the door open !! you can see how crowded and messy the room is !! No place to put the stuff that is out. 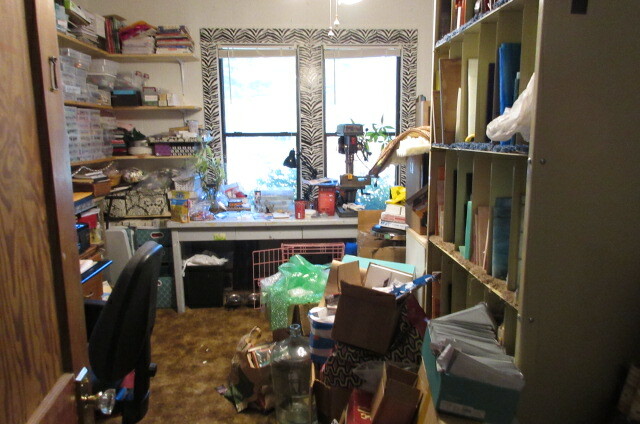 you can see on the right of the next picture a big box on its side on the floor, bubble wrap. Two big rolls for my Etsy shop, no place to put it. here is a shot from in front of the window to the door. First the mess on the bottom shelf, again, just no room to move. Stuff I am sorting through to go in the Etsy shop and eventually on my website when it finally gets set up. 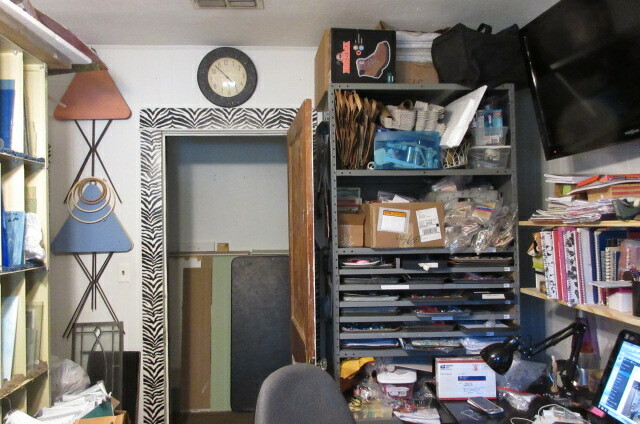 The next pictures are my old studio before we moved into this one, and I have more space to move around in that one. 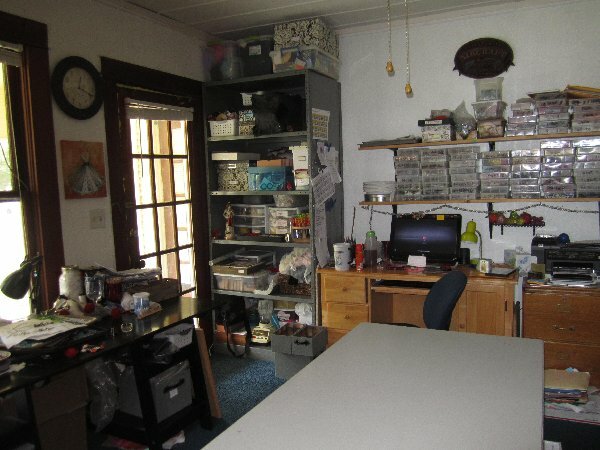 The pictures do not reflect the brightness of the room , it has so much more natural light than the current one. I had room for a desk and TWO work tables. 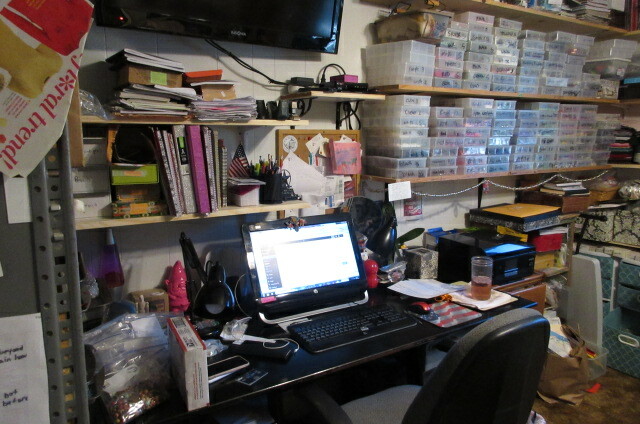 I have room for one and a desk and I need one for set up of materials and one for working, I miss that !! We are thinking of picking up some butcher block counter tops at Lumber liquadators for new work spaces . The big work table in the next pictures was supposed to be Davids and I kind of took it over, so I told him he could keep it, so he has to build me a couple of tables now, so the butcher block will help with that. We can build something to set along the walls in front of the windows on both sides. 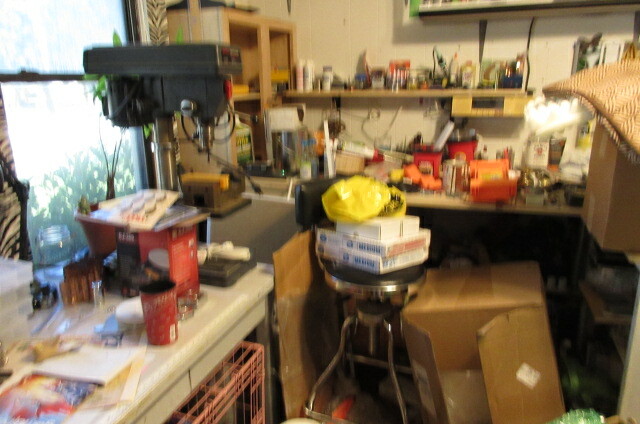 Lots and lots of work space. Now, in fairness I have so much more stuff than two years ago, WAY more stuff. Not even funny how much more stuff… I think you get the picture. But not having to share, that is huge. 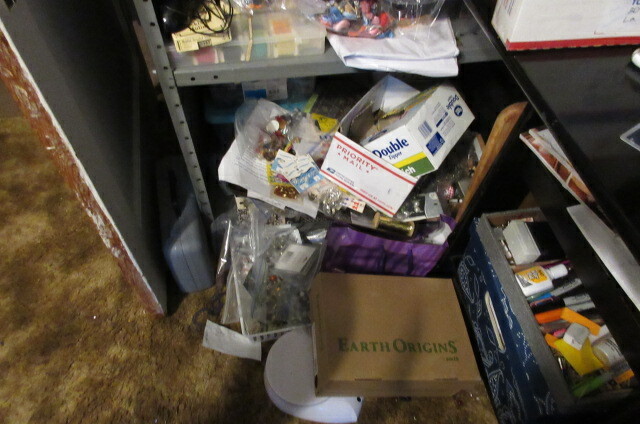 I have another side to the room I did not photograph because it was first a pile of stuff and then Davids side. I cannot find any pictures at this point, I know I have them, but I cannot seem to find them tonight. So, another big wall and corner next to the east facing windows, so that will be a wonderful help. 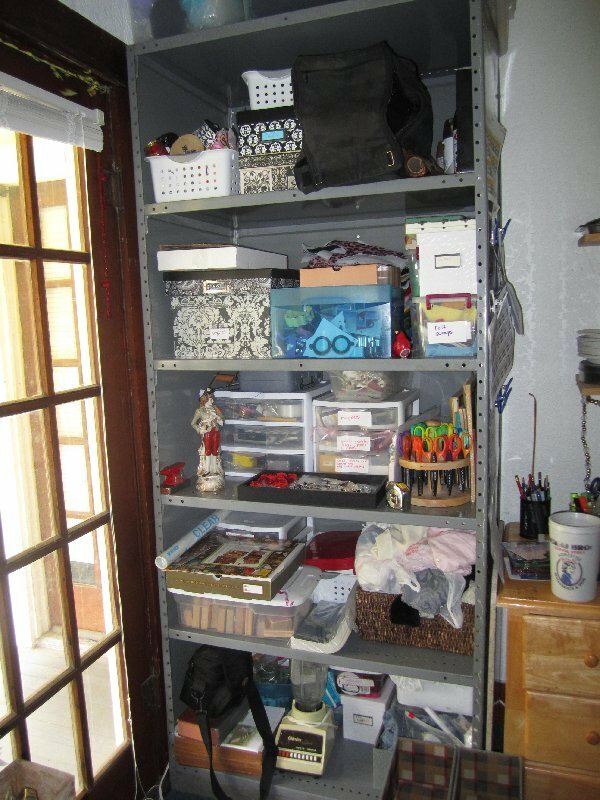 I also have a closet which we share in this room, so having a closet to myself will be wonderful !! So, they told us today they are moving out by December 1 which means by mid December I could be set back up in my beloved big front studio. I am sooooooo excited. I have been missing my four big windows, two on the east side and two facing south, along with a French door facing south which gave me light in the room all day. The current room after about ten or so in the morning gets dark with just the two East facing windows. 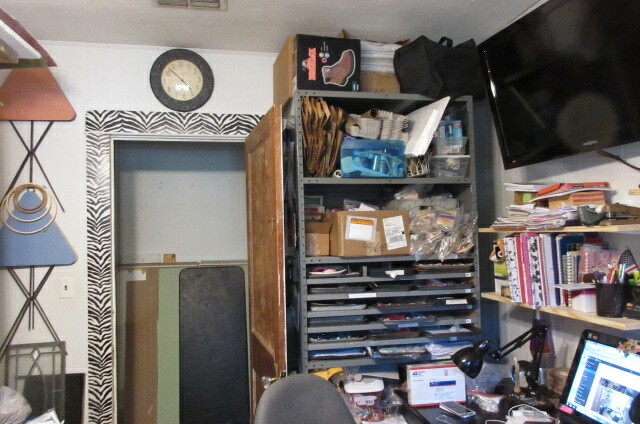 On top of that, I am sharing this room with my husbands stained glass studio and his tools, and it is a a good amount less wide than the front studio so we are squished in here and it is a mess. No room to put things. 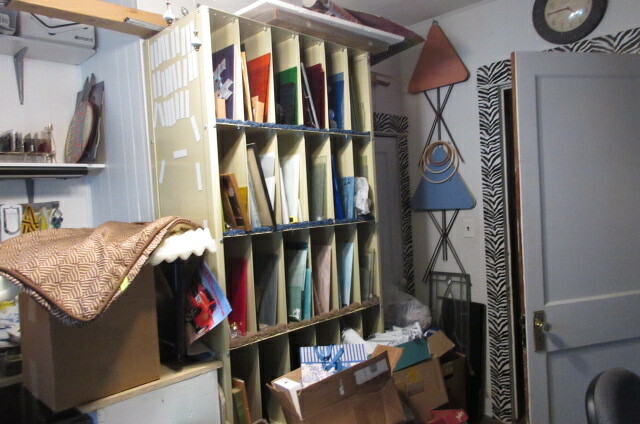 I am beyond thrilled to know in six weeks or so, I can start moving myself out into my own BIG studio. Last time I was in that studio I was sharing it with David. Now, we each will get our own studio. He loves this one, I love the front one. I will also have my door to the big 200 square foot porch with a swing, which is always lovely !! I am just very excited !! It is a very pretty view out those front windows. So, the kids are excited to move in with our son in laws mom and our youngest son wants to move home to go back to school so he will take the fourth bed room and we will let him have the front living room for his living room set, we use the back family room off the kitchen. So, we will still have our two studios and he will have his own living room, bed room and bathroom. We have our own master bed and bath and our own living area , so it will work out great. He will be moving in some time in Jan most likely. Maybe mid December. He has to find out. So, I am beyond thrilled to know I will be in my wonderful big studio very soon. I have missed it the last 14 months. So happy to know it is all happening soon. So, everyone is excited, the kids to move in with his mom, our son to move in here and give up his apartment and go back to school, and me and David to have our own studios for the first time ever !! Probably not the best time of year, but it is fine, kitchen reno still going on, so what the heck, throw in some more work , lol, we can take it !! thanks for stopping by !!! I will be posting more beads and sequins stuff in the next day or two !! !